Jeanette White is a freelance writer and editor living in the beautiful Pacific Northwest. She and her husband are homeschooling two daughters adopted from China. My daughters have been enamored with buses since they could point and say “Buh!” Spotting them on the street became a toddler game of Slugbug without the arm punch at every sighting. They knew all the words to “Wheels on the Bus” and sang them often. Too often. Even now, Mei-Mei and Jie-Jie like to watch kids disappear into school buses at a stop visible from our breakfast table. My own fascination with school buses ended abruptly in first grade, after a few weeks of riding more than an hour a day. I remember pulled pigtails, boys’ belching contests and painful boredom. But while one of the best aspects of homeschooling is the freedom to think outside the box, I couldn’t seem to think outside the bus when it came to the girls’ first day of school. That’s how we ended up standing at a city bus stop, chatting with strangers and soaking up a burst of September sunshine. We took the long way to a small Korean restaurant, passing parks and shopping centers and neighborhoods we don’t often see. It was high adventure for two kids who live nowhere near a city bus route. It’s not your typical rite of passage, but their first day of school was commemorated with good kimchee, ginger candy, and a post-lunch visit to an Asian market, where we browsed and bought a bag of salty dried plums. I failed to take my camera, but the girls have 2-hour bus passes for their keepsake box. Afterward, we were lured home by a stack of tantalizing new books and art supplies. For a book junkie like me, this part of homeschooling is a slice of heaven. First Language Lessons! Artistic Pursuits! Writing with Ease! The Case of the Fiddle-Playing Fox! (Oops, wrong stack.) Chalk pastels, watercolor crayons, whiteboard, 3-ring binders! Did I mention my fondness for office supplies? I started our week with subjects we’ve been doing all along at a more relaxed pace, like reading, math and writing. As the days passed, we added new subjects to the routine one by one. I thought of jugglers who start their act with three bowling pins and add the rest one at a time, taking a moment to get their rhythm with each addition. I’ll write more about how our lessons are going a little later. We’ve scheduled two weekly classes away from home—fiddle lessons and beginning gymnastics. Jie-Jie and Mei-Mei have been fiddling for several months, but gymnastics class fills a new time slot for us. Is it too much? Just enough? We’ll soon find out. Every friend I’ve quizzed has a different take on how much road time is too much. I’d love to hear your ideas about that. We ended our week of homeschooling with a belated Moon Festival celebration at our friends’ house, eating Chinese take-out and walking around the block with colorful paper lanterns lit up by tea candles. Four giggling girls led the way, circling back only when a candle needed to be lit again. Cloudy skies made it easy to forget the moon was nowhere near full. In a weird blend of cultures, Mei-Mei and Jie-Jie played The Chicken Dance on their fiddles while my friend playfully tried to follow on her erhu, shipped here from Shanghai. Something tells me we’ll manage to think outside the box after all. Now summer fun is over and my son has started middle school. It's a new school popular for its academic focus. We were thrilled he was able to get into the school, but we didn't know how much studying he'd face since we'd become used to his "fun-filled" elementary school. Now it's been three weeks, and I am totally surprised by the study load my son has been given and how many school rules he has to follow. Every day he comes home with a lot of homework. He has so many notebooks, folders and dividers from his classes and for his homework. They make his backpack so heavy that one day he wanted me to call the AP and ask if he could let students carry fewer books! The school is also very strict compared to his old school. Students can't be late for class and they must wear the school uniform. If they're late or don't wear their uniform, parents must meet with the AP. One day after he talked in class without raising his hand, his teacher asked him to write a 500-word essay about it. (This reminds me of how we used to write self-criticism essays when we were in school.) After only three weeks, they've taken tests for their subjects and parents were asked to sign on each test! I'm not used to this at all. In the past five years, he just had too much fun at his elementary school. He didn't have much homework and never had to write so neatly. When he talked in class without raising his hand, he either got time-out or his behavior was ignored. He had no tests except the state-wide ones. I thought that was the standard of American education - fun, fun, and more fun, plus creativity! But now I see a totally different picture of American education, and this is in a public school in New York City! I know it sounds a little bit like he's in school in China - study, study, and study! But I really feel that's how he can learn and grow. Today I asked him how he feels about his not-so-great grades on the tests. He said he thinks it's good to know where he stands and why he made those mistakes, and that he'll learn more and try his best to improve his grades next time. Wow, that's what I was looking for all these years in his education! I feel so relieved to know he understands the importance of learning and appreciates it. I'm also glad to see a public school like his focusing on teaching and learning! Before I went to see the Asia Society's exhibit "Art and China's Revolution," I didn't expect it would have much impact on me. I couldn't imagine that things from the Cultural Revolution period could be an art scene exhibited in the West. But when I visited the exhibit this week, I was totally impressed with everything I saw. All those oil paintings were so familiar to me (they were the everyday scene during the Cultural Revolution), but I'd never seen the original paintings myself and didn't expect them to be so large and powerful! Besides oil paintings, there are posters, wood prints, sculptures, water color paintings, and more. Yes, the themes of these works of art are very revolutionary, but they are all art pieces that actually illustrate the period of time we experienced. I also saw the posters that were once on the streets, at schools and even in homes, the Mao pins each of us wore, the rice bowls, plates, and other household products we used, along with all things culture revolution. Together they reminded me of the era I grew up in and the ideology in which we were trained. This exhibit may have shown the Cultural Revolution from a perspective new to many Westerners. Having grown up in that period - even though I learned Mao's quotations by heart every day, witnessed terrible scenes on the streets, and saw my Mom, who taught at Beijing University, separated from her family for about four years (I saw her only 12 days a year when she returned to Beijing from the countryside's unversity camp) - I still enjoyed my childhood, my school, my friends and whatever I did at that time. I believe I am who I am now partly because of what I experiened and learned in my childhood. I don't mean that I want to go back to that period, but there is another side of the story Westerners may not know. Perhaps you can start with this exhibit. Please visit the exhibit if you're in the city; if not, you can see and learn about the show from Asia Society's website. I have been back in New York for a week. This is the first time that I don't feel excited to be back in this energetic city that I love. Usually, when I leave Beijing, I don't miss it much. Yet even though I haven't lived in Beijing for about 20 years, this time I really do miss it. I miss the excitement of the Olympics and Paralympics; I miss the Bird's Nest, the Water Cube, the National Theater; I miss the clean and wide streets; I miss the modern and smooth subways--all the things I don't see here in New York! While I was searching for answers about my feelings for Beijing and New York, I read Thomas Friedman's Op-Ed "A Biblical Seven Years". Friedman put all those puzzles together and made such a powerful point when he said "... go to China to see the future." Then I read another blog "Beijing Diary", with the same message: "In many circles, China has moved beyond America and other countries, in looking forward to a future that combines the very best of East and West." I would have never expected to feel about Beijing and New York the way I do now. For me, New York is a world class metropolitan city that hardly any other city in the world compares with. But now I am not so sure about this anymore. Look at Beijing's streets, subways, buildings - the city has transformed itself into a metropolitan city in a matter of years. Beijing has built six subway lines within seven years and two more lines will be completed by early next year. Contrast that to New York, whose negotiations for the second avenue subway line are still pending after more than ten years! Beijing's International Airport Terminal 3 - the world largest single building - welcomes travelers around world with its grand and contemporary architecture, but New York's La Guardia and JFK airports welcome travelers with "dumpy terminals" and bumpy roads. And it was only a few years ago, when Beijing's streets were dirty and dust was everywhere because of the ongoing construction. But now all streets (really literally all) are so clean and many narrow streets have been expanded to boulevards, some even decorated with beautiful flowers in between. Of course, I know we cannot judge a city based on streets, architecture, or subway, there are many other important things that we should look at, such as the living standard, education, culture, housing, food, leisure, and more. However, I think Beijing has them all or are getting there at a rapid pace now. Beijing is not the same city as the one I grew up in, nor the one that I left about 20 years ago. It has became a modern metropolitan city that I can compare with even New York. Moreover, it has the grand ancient history and culture of the Forbidden City, the Great Wall, the Temple of Heaven, or the Peking Opera. 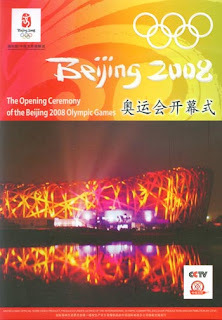 I know it remains to be seen if Beijing can live up to these new ideals and sustain the grandness, the cleanliness and efficiency now that the 2008 Beijing Olympic Games are over. I guess only time will tell. I thought long and hard about how to make Jie-Jie’s earliest memories of first grade special. In the end, we went to the beach. I wasn’t really that desperate to sell my kids on homeschooling. So far, they’re believers. It’s just that we waited way too long to reserve a yurt on Washington state’s coast, and the only time we could find an opening was—surprise!—the week everyone else went back to school. "Mom, how do you spell ‘today’?" "T-O ... and then what?" "A ... and then what, Mama?" "Y. What are you doing?" "I'm going to keep a diary of our trip." This would be a very long trip, I thought. Then I smiled. Her first diary! The week would be an extended field trip captured in Mei-Mei’s own words! Why hadn’t I thought of that? Admittedly, I’d already planned some of the week’s education. I’ve nurtured the girls’ love of audio-books since they were very young, so during the drive we listened to stories told by a first-rate storyteller, Jim Weiss. The Jungle Book was the favorite this time. I’d ransacked the public library and our bookshelves at home for field guides and kid-friendly titles about the ocean and Pacific Northwest rain forest. I tucked the books between their rolled-up sleeping bags and booster seats. Halfway to our destination, I checked “reading practice” off my mental list. That was taking care of itself. It truly was a week of firsts, as the girls reminded me again and again. They spotted their first banana slug in the Quinault Rain Forest, plucked their first sand dollar from the shore, visited their first cranberry bog. They learned what it’s like to fall asleep to the sound of waves slapping the beach, and oh, they blew their first-ever bubble gum bubbles just south of Seattle. They’d want you to know that. Already, I’m wondering if back-to-school should mean back-to-the-beach for our family next year. Now we’re home, and my attention shifts to the stack of new school books that somehow looks even more enticing than before. Our package of art supplies has arrived in the mail, and my niece remembered to flood the Nile while we were gone, leaving the delta surprisingly green. Instead of watching spellbound as the sun sets over the ocean, I’m contemplating ways to convince my husband he’d enjoy mummifying a chicken for that ancient history project. That is all. And that’s enough. 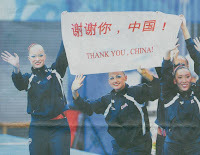 The Beijing Olympics ended two weeks ago, but the Games are still the topic among the media and Beijing residents. We still can watch and read collections of the best performances, biographies or stories of Chinese athletes on TV and in the newspaper and magazines. Wherever you go, Beijing residents talk about the Olympics, what they've seen in person or on TV, which games and athletes they like most, and what they think the Bird's Nest and Water Cube should become after the Paralymics. And the most talked-about is if Beijing should keep the traffic regulations enforced during the Olympics – drivers can drive only on the odd dates if their plates have odd numbers and vice-versa. People debate it on TV and radio, and send their text messages to all media considered. Of course, people without cars, which are the majority, prefer the regulation because it controls the unbearable traffic jams and keeps the air cleaner. People with cars have varying opinions: some are for the regulations, some are not. Some who disagree say they'd buy another car with a different plate number, so they can drive everyday. Then people worry this regulation would help keep many cars away from the streets if lots of people purchase two cars. People from all backgrounds try to voice their concerns and are curious to see if the Beijing government will make the final decision based on what most residents want. This decision will be made right before September 20th, the closing date of the Paralympics and the day the regulation was supposed to end. The Paralympics started on Saturday, September 6th. Although the media shows everything about the Paralympics, it's business as usual on the streets and for people in Beijing, compared to the opening day of the Beijing Olympics. (That day, all offices were closed, all stores were closed at 3 p.m., and flights were grounded at noon.) When I told my friend I'd like to join her family to watch the opening ceremony, they even didn’t know that the Paralympics would open on Saturday. But when we watched them together, everyone was surprised, excited, and moved by the great performances. We all thought it was as great as the opening ceremony of the Beijing Olympics. When the Paralympic flame was lighted, people were so excited to see the flame burning again. The next day all the media showed things surrounding the opening ceremony. Director Zhang Yimou discussed his ideas and visions for this ceremony. People talk about it at home and on the streets. When I went to the Bank of China, I saw crowds of people buying the tickets for different games, and all tickets for events at the Bird's Nest and Water Cube were sold out. Now Beijing has another 11 exciting days to celebrate the Paralympic sports and spirit, which will be just as exciting as the 16 days of the Beijing Olympics. You can learn more about the Paralympics at the official Paralympics site. Read more about the Opening Ceremony of Paralympics (ChinaSprout will sell the DVD of Opening Ceremony of Paralymic shortly). “I just cannot picture Jeanette as a mom.” That’s the first thing my brother said when he heard I was adopting a baby girl from China. I was surprised enough to jot down his comment in my journal. But in a way, I understood. He saw me as his latte-addicted, career-obsessed journalist sister who considered indoor plants a huge commitment. I didn’t know the front of a diaper from the back and didn’t care. Fast forward several years: My husband and I have two little girls, 5 and 6, and our lives have been totally and wonderfully changed by theirs. When I quit my job downtown awhile back, they helped empty my desk and blew kisses to the tall brick building as we walked away. I now work part-time from a home office (a.k.a. former nursery) with one daughter’s name still in animal-shaped wooden letters on the door. When someone—anyone—shouts “Mom!” in the grocery store, I spin around. I’ve washed my best clothes with crayons and sent embarrassingly enthusiastic emails about potty training. I stifled a shriek and smiled when my youngest daughter handed me a bright blue newt tail, still wiggling. These days, my barista’s name is Mr. Coffee. If all that doesn’t sound like total-immersion motherhood, try this: My kids won’t be going to school this fall. When their friends board the bus for kindergarten and first grade, they’ll be meeting me in the living room for lessons. We are joining the growing ranks of home-schooling families, and while that may raise eyebrows among some friends and relatives, I couldn’t be more thrilled. In fact, like a lot of eager, rookie home-school moms, I’m not waiting until fall to get started. That’s partly because I’m excited, but to be honest, it’s also because I’m a little nervous. Will I be good at this? Will my daughters grow and benefit in all the ways I envision? Am I depriving my kids of an important rite of passage by keeping them home? Can I juggle the roles of mother, teacher and professional writer—an integral part of my identity? Without driving my entire family crazy? To paraphrase my brother, can I picture myself as a home-school mom? (I don’t even own a denim jumper, but that’s a stereotype we’ll talk about another day.) I know I’m not alone in this adventure. I’ve even met quite a few home-schooling families with kids adopted from China. I’d love to have you join me on my journey into the rapidly expanding, ever-changing world of home schooling. I’ll share the ups and downs, successes and stumbles, great curriculum, helpful websites and other education resources I come across. I’m especially excited about the opportunity to make it part of our routine to dive into Chinese history and culture, from ancient times to the present. Over time, we’ll include everything from basic history and geography to learning the language. We’ll even dabble in Chinese cooking. In fact, we have a history chapter on ancient China coming up pretty soon. Time to start gathering materials. I hope those of you who’ve been down the home-school path before me can offer advice, encouragement or words of wisdom. Chances are, you can save me a step—or a misstep. And so, here I go. Summer is always fun time for kids in the US because they don’t have school, no homework, but only fun-filled camps, vacations, or just hanging around! Not Chinese kids, though! Nowadays, during summer break urban Chinese kids go to Olympic math, Oxford English, piano, swimming, painting and endless classes, in addition to doing their daily homework for the summer break. When I first time heard about summer camps in the US, I thought these camps are only for learning different things because the direct translation of summer camps - Xia Ling Ying in Chinese means schools for kids to learn during summer break. I thought American kids, just like Chinese kids, have to study during summer break, too. Then I saw my friends send their kids to camps where they just played. Later, it was my turn to choose a camp for my son. I realized all those camps are only for play, sports, arts, dance or music. I didn't see any classes to study anything except computers, which is just for fun, too. Since my son doesn't want to do sports, arts, dance, or music camps, I just sent him to one of those fun playing camps. Every day they just went to different places to play. Parks, swimming pools, museums, out-of-city drives - he had lots of fun and loved it. When he was old enough to attend overnight camp, he started going to another fun-filled camp and stayed two to four weeks. He has so much fun there that he looks forward to going every year! Last year, when a friend told me she sent her son to a writing camp, I thought she was crazy because now in my mind summer camps are only for fun, not for studying! How can kids go to camp to study? But a few months ago, I noticed my son really needed to improve his writing skills and I started looking for camps that teach writing, I found only one camp that teaches different subjects and when we received the demo DVD, we were disappointed and didn't know what to do. I asked my friend about that writing camp, and she advised us not to do it because her son didn't enjoy it all. You see, it confirmed how I felt when she first told me about it. But I didn't give up. I signed up my son to do the overnight camp for only two weeks and hoped something would come up later. Luckily, his new school (he will start in middle school this fall) offers a summer program teaching creative writing, math, music, and studio art to prepare kids for the middle school. I was so happy that he can finally study during summer break. But when he came back from overnight camp, he was so sad because he wanted to stay longer! This made me feel terrible and I thought maybe he should only have fun in the summer, not study. So now a week has passed with his summer school. He liked it very much, and even learned some grammar for writing that he didn't learn in the previous school. I am so relieved - finally someone teaches him grammar! Sometimes I still feel he should have stayed at the other camp longer to have more fun, but then I know it's worthy to go to summer school and learn something new! And compared with the schedules Chinese kids face in the summer, his classes are only a piece of sweet cake. I don't think any Beijingers ever expected the exciting Beijing 2008 Olympic Games would make their daily lives so inconvenient. Like me, all of my friends in Beijing were so thrilled to be part of this once-in-a-lifetime experience. But the excitment ended last April. Now when I talked to my friends there, it seems they just can't wait until the Games are over. I mentioned the frustrating traffic control issues during the Games in my last post. But some those restrictions actually started in late June. Only a limited number of trucks are allowed in Beijing. Starting July 20th, the cars with odd-numbered plates can be on the road only on dates with odd numbers, and vice-versa for even numbers. What does this mean? Residents have limited choices for their daily basic needs. I was told they either can't buy the vegetables they once bought or the produce became too expensive. Areas surrounding the national stadium are blocked and only authorized cars are allowed there, including the area of my father's apartment about a half-mile from the stadium. I'm curious to see what things look like when I return in two weeks. What do all these restrictions mean for businesses? One supplier told me business is so bad she's never experienced such a slow summer before, as very few tourists are in China now due to strict visa application processes. Some publishers tell me they'll close their offices in about two weeks until the Games end, which means we might not be able to get many books we need for our customers. Our forwarder has increased prices more than four times for picking up goods and delivering them to the port in Tianjin. Shall I ship the goods we need anyway? Shall I increase prices, too? Now I must calculate really carefully to see what we need most urgently. I thought it would end August 25, when the closing ceremony is over. But no, all these restrictions will remain until September 30 when the Paralympics are over! I don't think we can afford to wait that long. Now you know why Beijingers can't wait until the Games are over. I don't know if residents in London (2012 Olympic Games) and Chicago applying for 2016 Olympic Games) will have the same experiences as residents in Beijing. I hope not. But if so, I doubt they'll find this aspect of the Olympics very exciting. It has been a few weeks since I came back from China where I witnessed the national mourning of the Sichuan earthquake victims. It feels difficult to discuss that topic or comment on my blog about it because what I have read, heard and watched in China is so different from what I read and hear in New York. I am puzzled and wonder which side I shall take and believe and why there are so many differences between the Chinese and US reports. As you can see in my previous postings, I have only written a few stories from what I had witnessed about the earthquake tragedy while I was in China. These were only some examples out of thousands of moving stories, but I didn’t see any of those reported in the US. In the US news reports, most of the coverage deals with what went wrong during the earthquake rescue. These articles focused on the numbers of deaths that were only estimated by the local governments, and not by actual counts, the school collapses, with it the failure of the local governments and all the angry parents that protested against the local governments (which I totally understand and support them too). There was also focus on how Chinese scientists did not adequately warn the government that an accident like this could happen and the faultiness of building structures in potential earthquake zones. I realize that the US media is just reporting the reality of the news, but I wonder why only the tragic and angry stories are being published. This is not new to anyone, China itself and every other country in the world publishes a “one sided” news report. However, this is awful to me, because it means that people in either country can only hear a one-sided view. This allows me to understand how so many Americans whom I have met who have been to China tell me how much they love China and how surprised they are to see that China is so different from what they read, watched, or heard in the US. If people in either country only see one-sided stories, they will only have a one-sided view of the other country’s people and its life. But luckily, over 200 million Chinese now have internet access and many of them can read English, so they can read more Western news. Even though some websites are blocked, CNN, NY Times, Time, and more are not, so you can imagine what Chinese can read about the Western media. Now how about Westerners? How many of them can read Chinese websites such as Sina, Sohu, or a fashion magazine like Bazaar China? Can you imagine what special coverage about the Sichuan earthquake that Bazaar China has covered? Bazaar China has run a poignant series about the earthquake tragedy ranging in topics from shelters for the elderly, how families rebuild after the incident , the sadness of the parents for their children and the general pulling together of the human spirit. There are touching pictures that show children’s backpacks without their owners and military personnel aiding the wounded and carrying them out of the rubble on stretchers, not to mention the solidarity of the Chinese people during the moment of silence in Tiananmen Square or the celebrities like Jackie Chan and Zhang Ziyi gathering to aid the survivors. This is not propaganda, but another side of the human spirit of China that few Westerners see reflected in their media. Can you imagine Bazaar or any other fashion magazine publish such series in the west? I know many people here say China’s media is government’s propaganda, which I agree, but how about Western media? Here is one article I would like to share with you. Having puzzled on this topic for a few weeks, I finally got excited to see that a few reports about China are subjective and really can help Westerners understand China from different perspectives. First, I saw “Youth and Restless in China,” a documentary film about 9 young Chinese people who come from different background and have different dilemmas, dreams, and hopes. And NPR’s On the Media Goes to China has a great series about the media in China, which I will discuss further in upcoming blogs. In this series, you can really have a better understanding on how media works in China and if all things you read, heard, watched in the West really represent about China. (You can either read it or download it to listen to it, four stories and a blog). So here is to hoping that people in both China and the West will have more opportunities to read, listen to, or watch such subjective media reports so we all can have a better understanding of each other! I still remember when I took the National College Entry Exam in 1981. It was in the hot summer of July 7-9, when the dates had been set for all Chinese high school graduates across the country. All exams from 1979 to 2002 were taken during these three days. They were such important days for all Chinese high school graduates and their families that I don’t think we could ever forget it. So if you ask me when I took that exam, I can tell you without a second thought! For anyone who has been to China, you know how hot it becomes in early July. Regardless of how hot it was, millions of graduates had to take the exams in sweltering class rooms that did not have fans, much less air conditioning! I cannot use a hand-fan either, because we had to focus on taking the exam. Of course, water was not allowed into the examination room either, so we couldn’t drink anything until the exam was over, one exam lasting 2-3 hours in the morning and another one in the afternoon, totaling 6 exams in 3 days! When it was over, what a relief it was for graduates and their families! Yet, the anxiety would continue because we didn’t know if and which university we could get into! I still remember that there were only 9% of graduates who could go to universities during my time, but now that number of Beijing graduates who attend university has risen to 73% in 2007. Anyhow, every year people would complain how hot each July was and that such important exams really should not have been taken in such intolerable heat. Finally, in 2003, the government changed the examination date to June 6-9 which is so much cooler than in July. How lucky all these graduates are now, they are allowed to take the exams during cooler months and some classrooms even have electronic fans or air conditioners! I just received an email from a Chinese teacher who shared these “creative answers” from this year's entry exam for the Chinese language. When I first looked at the questions, I thought they were too difficult for anyone who should fill out blanks. But then I realized that we all have learned these ancient poems and should have known the answers if we had prepared for the exam for so long! When you read some students’ answers you can see the difference from the past to now in how young Chinese students have become so creative and materialistic. They don’t seem to care about whatever answers they could have. Now I have to share this in Chinese because it will be hard to translate these “creative” and "fun" answers! Only this April when I went back to Beijing did I begin to wonder if it’s really a good idea to be there during the Olympics. I used to be so proud that the Olympics would be held in Beijing and encouraged everyone to visit and experience the exciting atmosphere, even if they weren't going to the Games. I tried to get tickets from both the US and China official ticket agents, but didn't have any luck with that. I didn’t win any lotteries either (yes, it is a lottery process) after I requested the maximum numbers of tickets allowed. But never mind, I still wanted to be in Beijing to witness this life experience! Then in April, I stood in a two-hour line to apply for a visa in the Chinese Consulate in New York. I was shocked to see the visa office more packed than I’ve seen it in a decade. Very few applicants in front of me got a visa. I heard the clerk tell them that they were missing this or that document. I had never heard such requests before and wondered why China changed its visa policy. In the past, you could obtain a visa without any specific documents, only just by filling out a form. Now, as a tourist, visa applicants must submit the CONFIRMED roundtrip air ticket and paid hotel reservations (a simple reservation is not acceptable). If I visit my family there, I must have them write an official invitation. For business visas, applicants must submit an official original invitation from a Chinese company with the original seal. No fax or email invitation is allowed! In Beijing, my suppliers told me to make sure all goods were purchased by the end of June. Otherwise, I’d have to wait until September (too late for our Christmas season), because no trucks will be allowed in the city from mid-July to the end of August except those with special licenses for this period. Publishers in Beijing are rushing to print books that are usually done in July and August by the end of June instead, so they can distribute them nationwide in time for the semester starting in September! For ordinary citizens, if your car's license plates have an odd number, you can drive only on dates with odd numbers, and vice-versa for the even numbers. It might be good for air quality, but it creates enormous inconveniences for people who depend on driving for their day to day activities! The government has also starting knocking on everyone's doors to check IDs. Every resident must have a Beijing ID, and migrant workers must have official permits to work in Beijing. If you can’t show these documents, you have to leave Beijing, no exceptions, and this includes all westerners. Some westerners who have lived in Beijing for a long time must leave because of visa issues. Read this New York Times article to learn more about what’s happening to these westerners. And of course for visitors, hotel rooms will be the most difficult to get. Either hotels are already overbooked or those that are left are too expensive. Read this New York Times article about this topic. Here is another article about the empty Beijing hotels because Westerners aren't getting visas. I know that many Beijing citizens are renting out their apartments for the Olympic spectaculars and they are charging 1000RMB ($142.00) per night for a one-room apartment! See some sample apartments here. So now you may understand why I’m not sure if it’s a good time to be in Beijing during the Olympics. Nevertheless, I will be there and I will give you reliable updates on the Beijing scene during that exciting time. For those of you going to Beijing, I really am sure you’ll have lots of fun there. And don’t forget to grab Cityweekend and Timeout Beijing at your hotels or restaurants; they give you the best advice (sorry, much better than any guide books) on everything you need to live in or visit Beijing. I am disturbed by the New York Times article about Beijing’s dust problem. It is true that Beijing used to "blow sand" in the springtime, but this spring I was there in April and May and didn't witness any “sand” as mentioned in one of my other blog postings. When I saw the photo with this article, my first reaction was who would dare to come to Beijing if they saw this photo? However, this photo didn’t mention the date it was taken, which makes me wonder if it was from previous years when the weather was worse. In the past, Beijing has had this kind of weather for just a few days a year--never more than 10--and it happens only in spring, never in summer! This weather doesn't appear in summertime, so the Olympics should be safe from sand storms! The author also said dust “seeps and creeps and glides and slides across the floor, under the door and all around the walls” in his apartment and that “it’s like living in a beach house.” I wonder why he lives there if the dust problem is unbearable. Beijing does have dust, but not so much it merits the critique of a “beach house.” If Beijing is so dusty and unpleasant to live in, how can 15 million people live there, including more than 100,000 westerners? Some of my American friends have lived in Beijing for more than 20 years; how could they possibly survive if their living rooms are “sandy beaches?” When I left Beijing for the US this past April, I ran into an American high school principal at the airport who had just visited China with his family. He and his wife told me what a wonderful time they had and how much they love China and Beijing in particular. I've met many school administrators across the United States who, upon their return from Beijing, have told everyone they love Beijing and want to go back. If the air in Beijing is so bad, why would they want to do that? To be fair, in Beijing, I do have to wipe my tables once a day and mop the floors every 2 or 3 days; otherwise, you see dust everywhere. Here are two pictures I took in Beijing, one during spring and the other during summer 2007. Are these like the ones you see with the New York Times article? Is all this dust coming from factories around Beijing and the increasing number of cars on the street? Read this blog to understand where all this dust actually comes from. I really hope someone can offer better solutions than closing down factories, banning trucks from the city, or driving cars only on even or odd days in July and August in Beijing! In short, I hope you don't pass up a fabulous time in Beijing because of what you saw in this New York Times article. It is dusty there, but it is not as described!